PASIG CITY, 29 March 2019 – The Philippine Energy Efficiency Alliance (PE2) met earlier today a visiting delegation of the Chongqing Energy Research Society (CERS). Both organizations explored collaborative opportunities in the areas of energy efficiency technologies and services. The meeting was requested by CERS on the sidelines of the 2019 Business Opportunities Fair of the Asian Development Bank. MANILA, Philippines — The Department of Energy (DOE) is preparing to lay down rules once the Energy Efficiency and Conservation Act, which is seen to unlock a capacity of 45,900 megawatts until 2040 through energy efficiency adoption and investments, is signed by the President. DOE Undersecretary Felix William Fuentebella said Congress has already transmitted the reconciled EE&C bill to Malacañang. PASAY CITY, 21 March 2019 – The Department of Energy (DOE) and the Philippine Energy Efficiency Alliance (PE2) confirmed in a public forum held in the SMX Convention Center earlier today that the Office of the President has received on 14 March 2019 the Energy Efficiency and Conservation (EE&C) Act transmitted by both chambers of the 17th Congress. The report was made during the Energy Efficiency Experts’ Dialogue of the RE EE Philippines 2019, a bi-annual event of which PE2 is a collaborating partner for the energy efficiency sector. The measure which aims to institutionalize energy conservation and efficiency in the country has been transmitted to Malacañang for President Rodrigo Duterte’s signature, the Department of Energy (DOE) said Thursday. In light of the recent spike in electricity and oil prices, the Philippine Energy Efficiency Alliance (PE2) is seeking the passage of the Energy Efficiency and Conservation (EE&C) Act as a way to temper the impact of the price increases. 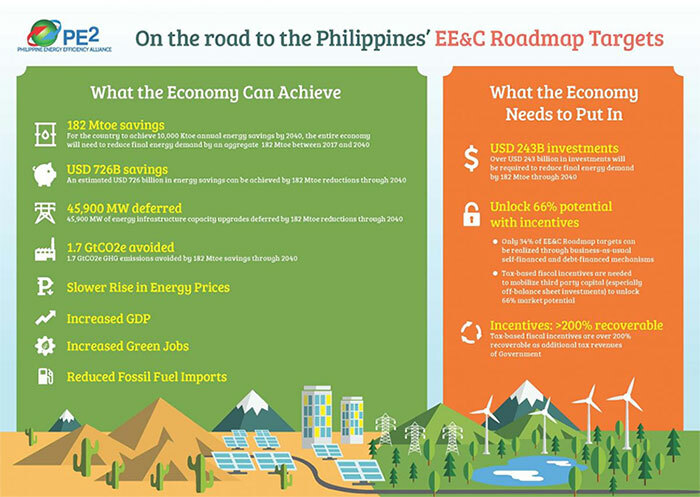 MAKATI CITY, 14 March 2019 – The Philippine Energy Efficiency Alliance (PE2) finally met earlier today the re-organizing Technical Working Group (TWG) that the Board of Investments (BOI) has created to craft and review the Energy Efficiency (EE) Guidelines under the 2017 Investment Priorities Plan approved by President Duterte. PE2 believes that expanding the EE guidelines will enable fiscal incentives to reach more EE projects across more end-use sectors. NEW DELHI, 8 March 2019 – The Alliance for an Energy-Efficient Economy (AEEE) invited Philippine Energy Efficiency Alliance (PE2) president Alexander Ablaza to present the role of non-profit organizations (NPOs) in advancing the transformation of the energy efficiency (EE) market through EE legislation and fiscal incentives during the International Energy Services Conclave 2019, held in this city from 6-8 March 2019. The international gathering was co-organized by the non-profit AEEE and the Government of India, through the Bureau of Energy Efficiency of the Ministry of Power. 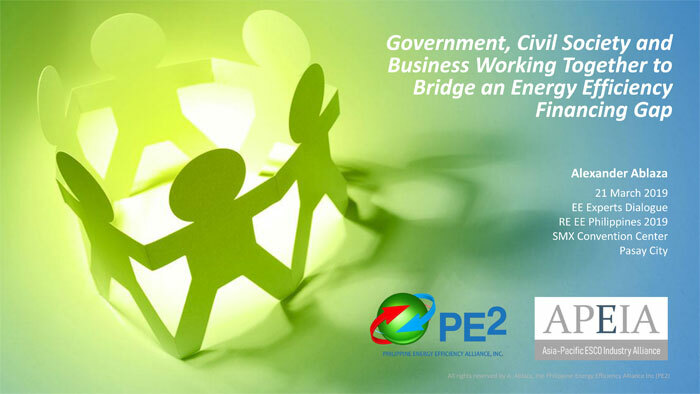 Philippine Energy Efficiency Alliance Inc. (PE2), is a non-stock, non-profit organization of energy efficiency market stakeholders.